When the air gets a bit too warm and the beaches beckon, there are a few things that come to mind that must be had immediately. Loose-fitting clothes or tight bathing suits must be matched with sunscreen and some body of water. Friends must be gathered and all must enjoy some sort of cool, refreshing drink to calm the warm embrace of the sun. Few drinks are turned to in this time of need more often than the Mojito. Pour soda into a Collins glass and set aside. Add all but soda to a mixing tin. Use a muddler to bruise the mint. Whip ingredients without ice (dry shake) and dump on top of the soda in your Collins glass. Add ice and garnish with freshly spanked mint. A Cuban-crafted concoction, the Mojito looks a lot like someone just took a Daiquiri and added some mint to it and then watered it down with soda – creating a pretty basic Rum Collins with some mint thrown in for good measure. Charles Baker’s 1939 bar-guide even refers to a “greatly improved rum collins” with “a bunch of fresh mint” being served in Havana at the time. 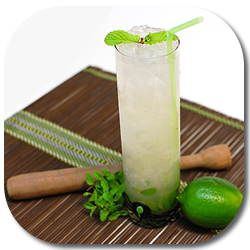 There are more fascinating rumors and legends surrounding the Mojito. There are tales that it was originally a drink called El Draque – named for Sir Francis Drake and made with aguardiente before rum was widely available. The slaves and other members of low society would have adulterated the barely drinkable, overly hot booze with lime and sugar. Such a back-story explaining the ingredients isn’t entirely necessary though. Early rums in Cuba would have been sufficiently terrible to drink on their own to merit the inclusion of sugar (probably in the form of guarapo), lime, and mint to make the experience something slightly less torturous. At some point the drink made its way from the fields to the cities and the beaches, and it was there that it likely garnered its soda and tall glass. It was also there that the drink became a hit among tourists from around the world. Mojitos at La Bodeguqita in Havana are made by unflappable bartenders in unfathomable quantities. They line up a battery of tall glasses along the bar during lulls, and preload them with mint, lime juice, and guarapo. When the mojito orders flood in…a bartender adds a splash of club soda and then pulverizes the whole mess with a wooden muddler the size and shape of a souvenir baseball bat. The process results in a small, frothy geyser, which sprays the bartender and a few patrons. No one seems to notice. Then comes ice. Then the rum is lavished on top freehand. The approach taken by these industrious bartenders is a lot of fun, but a bit messy. Your typical bartender seems to make the mojito by adding everything but the soda to a mixing tin or glass and then muddling it within an inch of its life before adding ice and then shaking the bejesus out of the whole mess, dumping it into a glass, and then topping with soda water. There is a fundamental problem to this approach which was first pointed out to me by bartender friends in London. At a nerdy, sciency level, when you muddle your mint too hard and then shake it with ice, you end up lacerating the mint and releasing chlorophyll into your drink. Chlorophyll isn’t bad for you, but it doesn’t taste particularly good. At the level of simply enjoying the drink the problem is that you end up with tiny pieces of mint floating all through the resulting cocktail – pieces that get stuck in straws or end up in the spaces between teeth. I prefer a middle-of-the-road approach, which is the muddling to bruise the mint (hence the word “muddling” and not “murdering”) in the rum, lime, and sugar, followed by whipping the ingredients by dry-shaking. This gives you some additional bruising, but more importantly integrates all of the ingredients together and aerates the lime juice without lacerating your mint with ice. By pouring the drink under ice (dumping the contents of the shaker into the glass prior to adding the ice to the glass) you also manage to keep the mint that you’ve muddled at the bottom of the glass and not floating up to the top and into your guest’s smile. From there you can decide whether you prefer to have the soda already in the glass (which means it’s premeasured) or if you prefer to add the soda later. I like to add the soda first and pour the ingredients over it because the soda will naturally rise through the rest of the mixture, giving you better integration of the whole drink – whereas topping with soda means that most of the soda will remain on top of the liquor. How do you like to make your mojitos? Honestly, I almost never make a Mojito at all. I do on occasion make a variant wherein you replace the mint with basil. Everything else applies. Why, because my wife prefers it that way. This is called sound reasoning. I will have to try your methodology the next time I make a mojito. I take a different approach and build mojitos in the serving glass (a collins glass) that similarly avoids most of the pitfalls your method overcomes. I lightly muddle the mint in the lime and simple syrup to bruise the mint, then I add crushed ice ice to fill the glass and also to keep the mint leaves at the bottom of the ice pile. Add rum and stir to chill but being careful not to disturb the mint too much. Top with soda and another quick stir, garnish with slapped mint sprig and serve. I usually have taken the more standard approach to my mojitos, and wind up with the mint problem. I’m going to try your way next time. I look forward to not having little pieces of mint stuck in the straw and my teeth. Matt, this is a greatly entertaining recipe. Puts me in the mojito mood. Havana Club here I go! I muddle granular cane sugar with mint leaves and half a lime with the core cut out. It takes a lot of force to juice the lime pieces this way, but you also extract peel oils. Then I add the rum, ice, shake like hell, and *double strain* onto fresh big cubes and top with soda. Quick stir, mint garnish. This would take too long for service, but it’s fine at home. I have to say, I’m really impressed with your dry shake method, which I’ve never heard of before for a Mojito. It truly seems like a great middle ground to produce that middle ground amount of mint flavor in your drink. As I’ve said before on other blogs’ comments before, it really boggles my mind how booze nerds obsess over vegetal ingredients like Chartreuse and Agricole and bitter ingredients like amari, but they consider a Mojito with the slightest bit of vegetal or bitter character as an affront to everything they hold dear. This reminds me that I need to work on an over-muddled mint gin drink that pairs the mint’s chlorophyll with the gin…. DJ: I think it comes down to “What is the drink shooting for?” The Mojito isn’t supposed to be bitter and vegetal, it’s supposed to be sweet and refreshing. Certainly if you don’t find mint to be overly bitter/vegetal when lacerated, you can simply double-strain your mo’ to get it clean – though I feel like you lose something in the presentation that way. I like mojitos with a little less mint – maybe because the mint I grow is so strong. I also like making mint syrup, thanks to a Beachbum Berry recipe (Frohito) from one of his books. Also (I like different styles…just as long as I’m enjoying the summer), I’m going to try a mint syrup/lime syrup version here soon, curious how it’ll turn out. No matter what the mojito – I prefer Cuban style rum. Matusalem has treated me well (having not tried Havana Club).